We read in today’s first reading from the Book of the Prophet Isaiah when he encounters the thrice holy God: Woe is me, I am doomed! For I am a man of unclean lips, living among a people of unclean lips, yet my eyes have seen the King, the Lord of hosts! Simon Peter tells Jesus in today’s gospel, after witnessing the miraculous catch of fish: Depart from me Lord, for I am sinful man. We see that both of them immediately feel unworthy in the presence of God, aware of their own limitations and shortcomings. As a result of encountering God, life would be changed in a radical way. They will never be the same person. St. Paul in today’s second reading from 1st Corinthians says the same thing. For I am the least of the apostles, not fit to be called an apostle…But by the grace of God I am what I am, and his grace to me has not been ineffective. 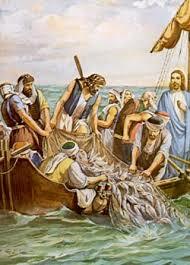 Jesus invites Peter into a vocation to follow Him: Do not be afraid, from now on you will be catching men. Isaiah hears the voice of the Lord: Whom shall I send? Who will go for us? What is the response to this invitation? Isaiah promptly responds: “Here I am”, I said, “send me!” Peter does the same: …they left everything and followed him. God speaks to each one of us as well. How so? Perhaps much like God spoke to Elijah… more in a tiny whispering sound, then in the “noise” of our lives. We obey God by choice, just as Isaiah and Peter did. Are we aware of God speaking to us throughout our day?…in prayer, Sacred Scriptures, the sacraments, in creation, through life’s circumstances and through our brothers and sisters in Christ. Are we listening? How are we responding?